Looking back, the much desired Better Market Street project was originally supposed to break ground this year and finally fix an important and congested street that badly needs an overhaul. It was later pushed to 2015. But now, the Better Market Street organizers (part of the SFMTA) want to further delay the project by another two years so they can study the Mission Street alternative (putting protected bike lanes onto nearby Mission Street instead of Market). That means that cyclists will have to wait until 2019 for completion. That means there will be another six years of having an insufficient bikeway on an important and increasingly congested corridor. That means that the cycling community may not get the kind of bike lanes they need and want on the street they need and want them to be on. This has members of the SFBC and bicycling community in SF concerned and even infuriated. In response to the announcement to delay starting bicycle improvements on Market Street from 2015 to 2017, the SFBC organized a Market/Mission Survey Ride back on March 4th to take a closer look at the issue. With the SFBC’s Planning Director, Neal Patel and an SFMTA project manager, Andrew Lee and a dozen SFBC members, we rode around the area to survey both streets and share our thoughts. The tour was very insightful and helped me form my opinion on which street would be the better alternative, Market Street or Mission. I started out in staunch support of bike improvements on Market, but must admit that after the tour, I wavered. It did seem that Mission was not as bad of an alternative as I thought. However, after more time considering, I returned back to the conclusion that Market Street would still be better, although Mission does have a lot going for it. Market Street has more cyclists riding on it than any other street in this country, carrying an estimated 5,000 cyclists per day. Already, before any sort of bike facilities were put in, cyclists were already using the street, the shortest and most “natural” route to their destinations. Remember, two of the big reasons commuters cycle is because it is more convenient than taking public transit and it takes the stress out of owning a car in the city. So naturally, cyclists will want to take the shortest, most convenient route. 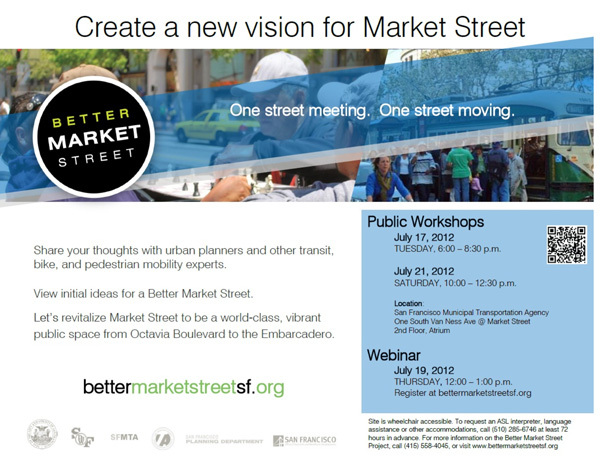 Even if Mission Street is built for bicyclists, Market Street will probably still attract a large number of riders. I am no urban planner, but I do know that traffic engineers need to design streets according to how people naturally move about in the city. 1. There are two dozen MUNI bus stops and four BART stations along the street that complement multi-modal transportation. 2. Market Street is connected to the Wiggle which is the flattest way to get to Golden Gate Park and Ocean Beach. Market Street combined with the Wiggle is the most direct, best and shortest route for cyclists from west to east and vice-versa. 3. It can bring you to important centers for jobs, commerce, and recreation such as City Hall, Union Square, Downtown and the Financial District, South of Market (SOMA), Ferry Building, and the Embarcadero to name a few. 4. It also has 3 miles (4.8 km) of shops, retail and eateries and for most of the street, car parking is not allowed. This kind of street scape sets up very well for both pedestrians and cyclists to frequent. So the question is, “Why is Better Market Street still trying to reinvent the wheel by looking into Mission Street for the bike highway and in the process delaying the entire project?” Andrew from the SFMTA stated that it’s obviously the cost and the complexity involved of renovating Market Street to accomodate both bicycles and buses. 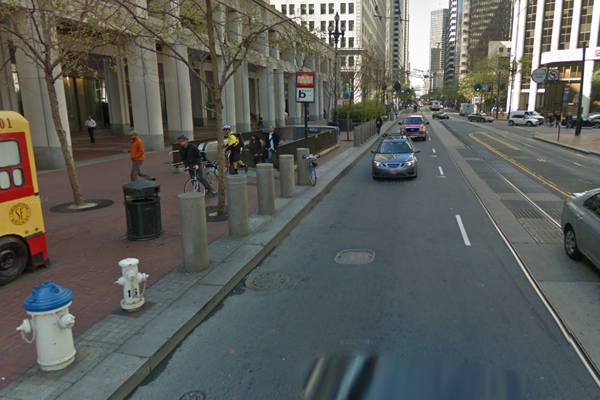 The 1.5 mile (2.4 km) section between 8th Street and the Embarcadero currently does not have enough space for both. The sidewalk curbs would have to be scaled back a few feet all the way to the BART entrance to make room for a cycle track. The fire hydrants would need to be moved back affecting underground piping. So it would require a lot of major structural reconfigurations (see image below). More info on what would need to be done for this is here. Embarcadero BART station near Spear Street looking westbound. Image courtesy of Google Streetview. With the city’s population growing at 1% annually and the relocation of major company headquarters like Twitter and Dolby to Market Street, placing the bike highway on Market is going to not just accommodate current needs, but also prepare this city for the future. It may be an expensive project of $350 million USD, but investing in cycling infrastructure is the best return on investment this car-centric city can afford. 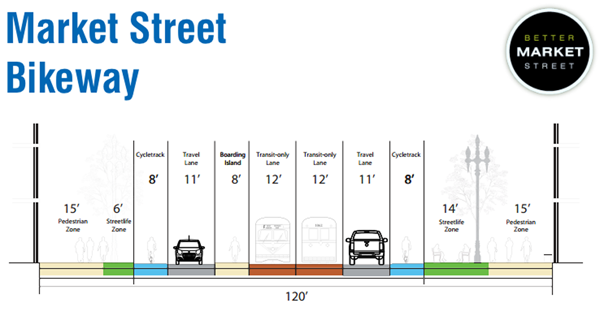 To conclude, Market Street is and will continue to be the selected route cyclists will choose to ride despite its urban jungle of a mess. However, like I said, Mission Street does have something going for it which I will discuss in another post. To me, it’s completely mind-boggling that there is no discussion whatsoever as to why they are keeping the travel lane in current designs. Get rid of the car travel lane and there is no need for expensive reconfigurations or pushing bikes to Mission St! SFMTA or any public transportation agency is not going to close down any street in any city. You would have thought by now with so many reported success from Europe that at the least SF would be closing down some streets and turning into a walking/cycling/light rail haven. Andrew from SFMTA said that they will only reduce cars on there but not complete restriction on Market. I suggested to Andrew that why don’t buses travel on the same lane as the MUNI light rails and streetcars since the traffic on light rail designated is not busy. He responded by saying that there is huge bottleneck near the Embarcadero so two lanes have to remain open. Oh, taxis get special treatment in SF. Did you notice those blue bumper stickers allowing taxis drivers to park on bike lanes? Ridiculous right. What about those taxis being allowed in bus lanes only?